As a general rule, BIOS Setup program has character-based interface and is operated by a keyboard. There is a menu with the list of Setup basic program division in the main window of BIOS Setup. BIOS Setup menu bar usually resides in two columns; this variant is used in different versions of AwardBIOS (Phoenix-AwardBIOS) and AMIBIOS. The given interface is used in system boards of Gigabyte, MSI, Foxconn, ECS and many other manufacturers. Another common variant of BIOS Setup interface is the one with the action bar in the top of the screen. 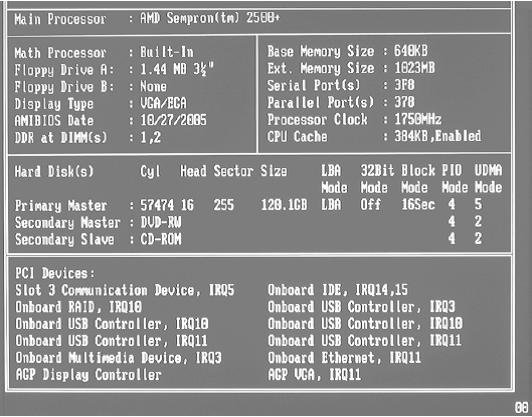 Such interface is used in PhoenixBIOS, IntelBIOS as well as in some of AwardBIOS and AMIBIOS versions. This interface variant is used in ASUS, ASRock, Intel and some other system boards. All the BIOS Setup divisions have similar structure. F10 – exit from BIOS Setup with all the changes saved; in this case it is necessary to confirm action by pressing Y and Enter keys. The values of F1-F10 function keys can differ in certain BIOS versions, therefore it is preferable to check the system board manual or message in the screen bottom before use of these keys. In general, every model of system board requires personal BIOS version because it incorporates particular qualities of the usable chipset and peripherals. However, it is not profitable for the manufactures to spend time and resources on the full cycle of development their owned BIOS that is why BIOS launching is usually split into two stages. BIOS manufacturer (the most famous of which are AMI, Award and Phoenix) develops its basic version, where all functions, not dependent on the set of features of any given chipset, are implemented in. BIOS version for the system board’s particular model and various BIOS modifications or upgrades designed for the same model. The name of such BIOS version usually consists of board model abbreviated notation to which modification or update number is added. When BIOS setup program is being outlined, the term “BIOS version” implies BIOS version for the particular system board model. The first device that starts up after pushing computer power button is PC power supply. If the supply voltages are in good working order, central processing unit will come into operation which reads out content of BIOS microcircuit and starts performing microcircuit-based Power-On Self Test or POST. POST solves several basic problems. 1. Initializes and adjusts basic system composition: processor unit, chipset, internal memory and video display adapter. 2. Examines CMOS checksum and batteries’ condition. If the CMOS checksum is wrong, default values will be loaded. 3. Tests processor unit and internal memory. The testing results are usually displayed. 4. Initializes and adjusts hardware peripherals: keyboard, mouse pointing device, disk drive mechanisms, hard disks and others. Data about detected storage drives is usually displayed. 5. Distributes resources between peripherals and displays a datasheet with detected peripherals and appointed resources for them (Pic. 2.2). Pic. 2.2. Final datasheet of POST procedure. 6. Searches and initializes peripherals from the BIOS. 7. Activates bootloader. When the successful POST procedure is accomplished, boot sector search, which can be located on the hard disk or removable media, starts. Peripherals inquest order is set with the help of parameters BIOS First Boot Device, Second Boot Device, Third Boot Device or related to them that are specified further. BIOS (Basic Input/Output System) is a program for the initial boot of a computer, equipment adjustment and input/output functions support. input/output functions support with the assistance of BIOS program interrupts. System BIOS comprised of built-in functions for the manipulation with keyboard, video display adapter, disk drive mechanisms, hard disk drives, input-output ports, etc. These functions have been used in such operation systems as MS-DOS, and they are almost not used in Windows modern versions.